Hunan is a fantastic part of China that counts many famous scenic spots. Among these, the best-known include: Dongting Lake, the Yueyang Padoga, Fenhuang Ancient Town and the Wulingyuan Scenic and Historic Interest Area where the gorgeous Zhangjiajie National Forest Park is located. The following are the top 10 attractions that Hunan Province has on offer. Let's take a closer look. 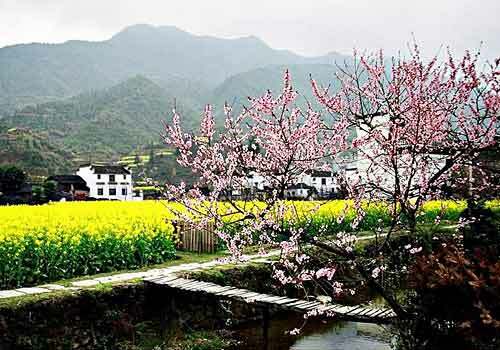 Peach Blossom Land, located at 23 kilometers (14.29 miles) from Changde City, is a fairytale land described by Tao Yuanming (365-427), a famous poet of the Eastern Jin Dynasty (316-420). With a history of more than 1,600 years, the area now has become a famous tourist site. It features beautiful mountains, peach forests, fields, temples, as well as the mystique of many wonderful legends. It has nearly 100 spots and four great scenic areas, including the Taoxian Ridge, Taoyuan Mountain, Taohua Mountain and Qinren Village. Every year, the area witnesses a peach blossom party which is an important festival in Hunan.